An original letter of correspondence between Joshua Coffin Chase and Isleworth packinghouse superintendent Corbett Hutchinson. 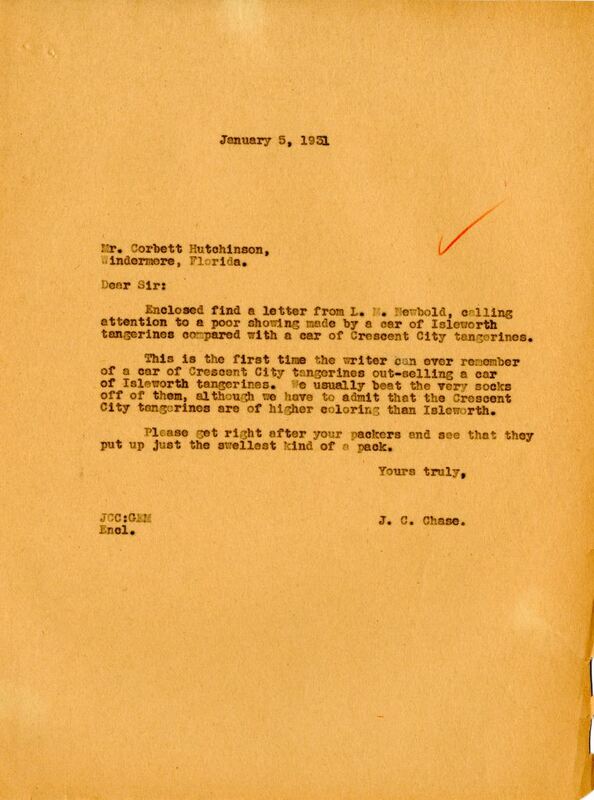 Topics discussed in the letter include an enclosed letter from L. M. Newbold regarding the poor showing of a car of Isleworth tangerines in comparison to a car of Crescent City tangerines. Original letter from Joshua Coffin Chase to Corbett Hutchinson, January 5, 1931: box 49, folder 20.91, Chase Collection (MS 14), Special and Area Studies Collections, George A. Smathers Libraries, University of Florida, Gainesville, Florida. Digital reproduction of original letter from Joshua Coffin Chase to Corbett Hutchinson, January 5, 1931. Enclosed find a letter from L. M. Newbold, calling attention to a poor showing made by a car of Isleworth tangerines compared with a car of Crescent City tangerines. This is the first time the writer can ever remember of a car of Crescent City tangerines out-selling a car of Isleworth tangerines. We usually beat the very socks off them, although we have to admit that the Crescent City tangerines are of higher coloring than Isleworth. Please get right after your packers and see that they put up just the swellest kind of a pack. Chase, Joshua Coffin. 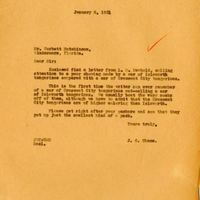 “Letter from Joshua Coffin Chase to Corbett Hutchinson (January 5, 1931).” RICHES of Central Florida accessed April 23, 2019, https://richesmi.cah.ucf.edu/omeka/items/show/2774.